← What can we do to the dark spots on an aluminum sheet? haomei aluminium offers a wide variety of tread plate in both 3003 and 6061 alloys. Commonly referred to as “Diamond” due to its raised diamond-shaped pattern, tread plateexhibits strength, durability, ease of welding, corrosion resistance and skid resistance. Tread plate is available in 3003 with the typical H22/24 temper where welding is readily accomplished. For the highest strength applications, Tread plate is stocked in 6061, frequently heat treated and aged to T6 temper. Tread Plate is stocked in thicknesses of .063 – .500 and all material meets ASTM and/or AMS specifications. With our processing capabilities, we can produce to your specific requirements. Our quality Aluminium Checker Plate and Aluminium Tread Plate has a 5 bar raised grip pattern to give it fantastic grip properties and helps improve safety. 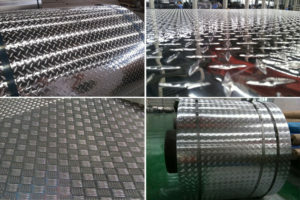 Aluminium Checker Plates non-skid properties mean that it is commonly used for various different uses including vehicle and trailer floors, ramps, industrial settings, for protecting walls and buildings and more recently for shopfitting and interior design. Our Aluminium Checker plate is available in three various thicknesses suitable for various uses. We also have a range of sizes in various lengths in stock for a quick delivery. This entry was posted in Aluminium Tread Plate and tagged aluminium checker plate, Aluminium Tread Plate. Bookmark the permalink.